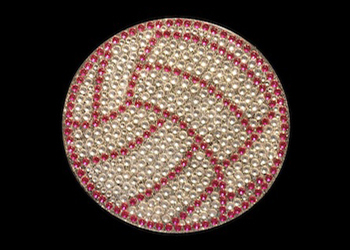 Pink Volleyball window sticker with rhinestones and glitter is perfect to show your support for your Girl's Volleyball Team. Use on a car window or anywhere! 3.5"x3.5" diameter Vollyball Window Sticker! Choose Clear & Black or Clear & Pink. Bling for your car, show your pride. Click here to view our amazing Volleyball Pendant Charm.